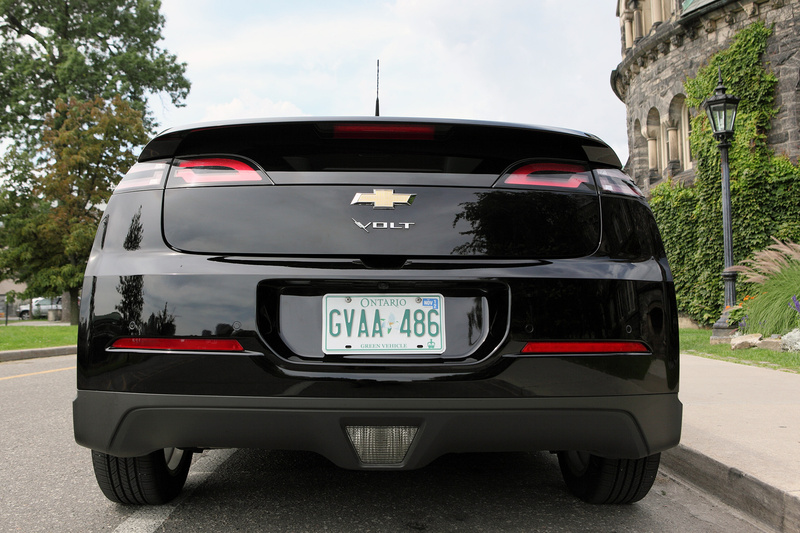 The Chevrolet Volt is a plug-in hybrid electric vehicle which has been offered by General Motors since 2010. It is the first full production modern electric vehicle (EV) GM has developed and builds on their experience from earlier electric vehicle pilots, such as the EV1 in the mid-1990s. As the description of the vehicle implies, drivers can plug-in their vehicle to the electricity grid to recharge the battery which enables them to drive entirely on electricity. Does this game changing technology live up to all the hype? And how does it compare to conventional gasoline powered vehicles? Read on to find out. The MSRP for the 2012 Chevy Volt is $41,545 (CAD) and it is eligible for government incentives in a number of jurisdictions. In Canada, the province of Ontario, Quebec and British Columbia all offer purchase incentives. In Ontario, the incentive value is $8,231 (CAD) resulting in the starting price of the Volt being reduced to $33,314 (CAD). So what does the post incentive price of the low $30k get you? More than you may think. The Volt is powered by a dual 111 KW electric motor producing 149 hp along with a 1.4 liter, four cylinder, gasoline engine producing 85 hp. While the Volt’s acceleration won’t win you any races at the track, it is still quite impressive. When entering the freeway you only have to nudge the accelerator to get you up to cruising speed. Officially, the Volt’s acceleration time is 9.2 seconds running on electric-only mode, and 9.0 seconds with the gasoline engine assisting propulsion and overall top speed is 160 km/h (100 mph). The all important stat for electric vehicles is the range. The Volt’s range is approximately 40-80 kms (24 to 50 miles) on the electric battery and over 500 kms (310 miles) using the gasoline ‘range extender’ engine. It should be noted factors such as driver behaviour, ambient temperature, road conditions, terrain, etc… can all have an impact on the total distance that can be driven in electric only mode. This is common to all electric vehicles.In total, Volt drivers get up to 580 kms (360 miles) of range from both the battery and gasoline engine combined as it has a 35 liter (9.25 gallon) gas tank. This combination is the real differentiator for both daily commute driving and those all important road trips. Although the Volt is a compact car it provides users with a lot of pep. This was in fact evident since the RedlineNorth Team was impressed with the power behind the wheel off the line, largely thanks to the large amount of torque the electric motor provides. While braking does feel different in an electric vehicle largely due to the regenerative braking technology, overall the brakes felt as responsive as traditional brakes. And after a few days driving the Volt, the unique characteristics of the regenerative braking became so familiar we were not aware of the difference. 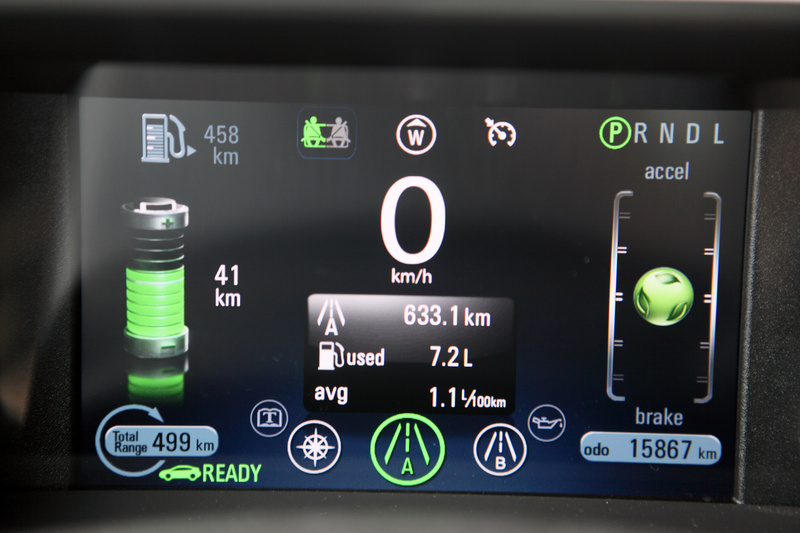 As a result of the batteries being located along the bottom of the vehicle (see picture above) the Volt has a low center of gravity and really hugs the road when cornering. Once the electric battery has been depleted the car automatically shifts into ‘range extender’ mode utilizing the gasoline engine. This switch is seamless for the driver and there is only a slight hint of engine sounds once it kicks in, much less overall noise than in a conventional combustion vehicle. The Volt seats four, as the back middle seat is taken up with the 16 kWh battery. Our Volt tester came with all the available interior features including a premium trim package consisting of leather wrapped steering wheel, heated driver & passenger seats all in a supple black leather. 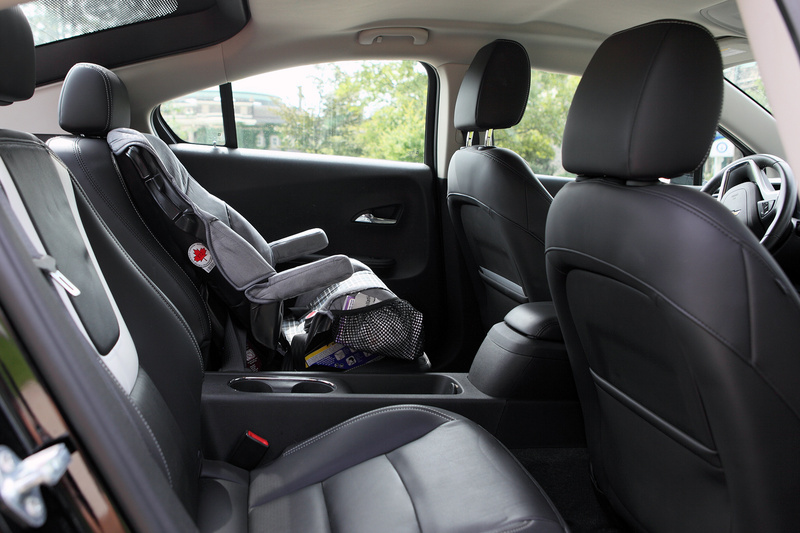 During the test period, we used the Volt around the city for transporting the whole family, including an infant. The installation of the car seat was easy thanks to the UAS and the lack of a middle seat didn’t provide much inconvenience. There was also sufficient trunk space for all the extra ‘stuff’ that comes with transporting young children. However, families with two young kids going on an extended trip may find storage space limited. Similarly, rear leg room is somewhat limited, but legroom and trunk space are largely on par with other compact class vehicles. 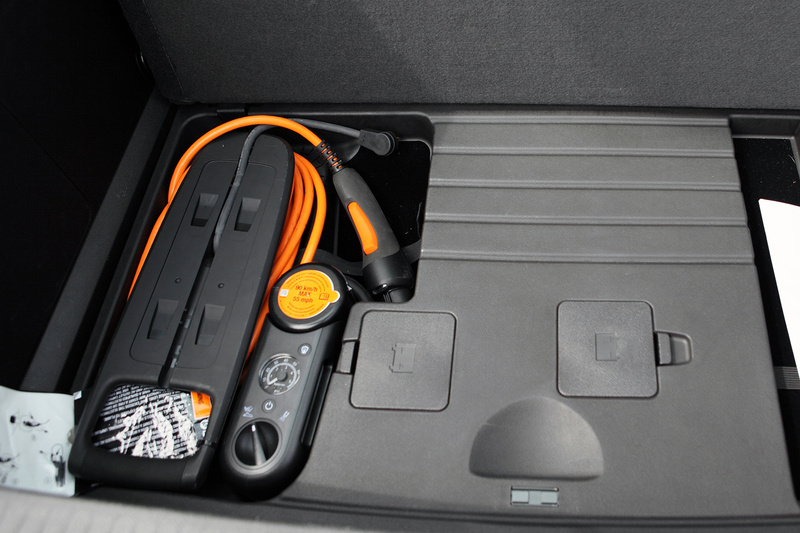 The location of the Level 1 (120V) charger under the trunk floor, where a spare tire is typically kept (the vehicle comes with a tire repair kit and air compressor) could be a bit inconvenient on multi-day trips. Since the current design requires you to unload the trunk in order to lift up the trunk floor to access the charger. Having a split trunk floor lid requiring only one side to be free of trunk contents in order to access the charger would likely be a better design. 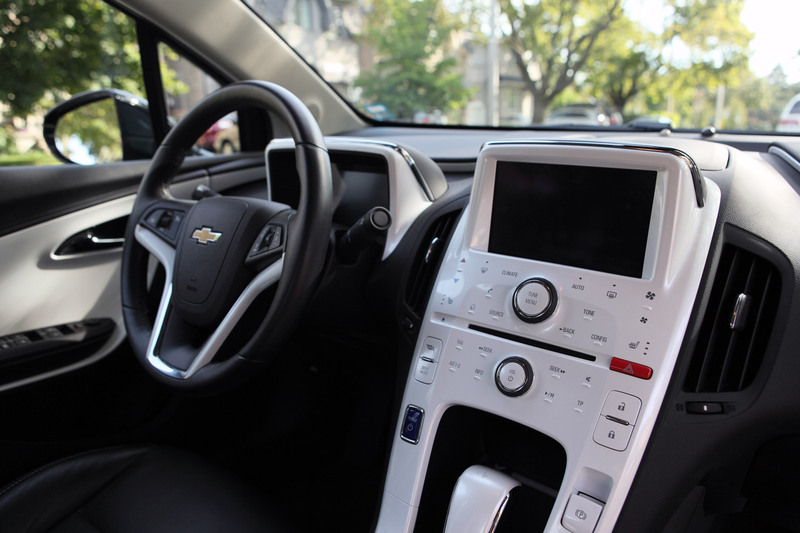 The infotainment system in the Volt is fairly standard for its class and includes; a 6 speaker system with SiriusXM satellite radio, standard Bluetooth hands free phone and audio connectivity, remote starter, OnStar®, USB ports and an Android and iOS compatible app (OnStar® Remote Link) that provides key vehicle information, including current state of charge. Optional equipment in the test vehicle included a rear vision camera and parking assist. The parking assist uses ultrasonic frequencies to let you know while backing up when you are nearing an object. A warning symbol also appears in rear view monitor showing what side of the vehicle the object is located, a really nice feature for the urbanite. However, while the rear camera option is a positive feature from a safety perspective, when parking in tight spots, such as a downtown parking garage, the warning beeps can become distracting and at times we were wanting a mute button. Nevertheless, this is only a minor nuisance and did not significantly detract from the overall driving experience. For those so inclined, pressing a button on the dash provides a wealth of information on your driving characteristics. There is real time feedback on your driving style in the form of a round green ground ball in the instrument panel that will shift upwards if you are draining energy and stay stable or move downwards if you are recovering energy, through the brakes for example. It can be quite addictive to try and drive in such a manner as to keep the ball steady or move downwards. 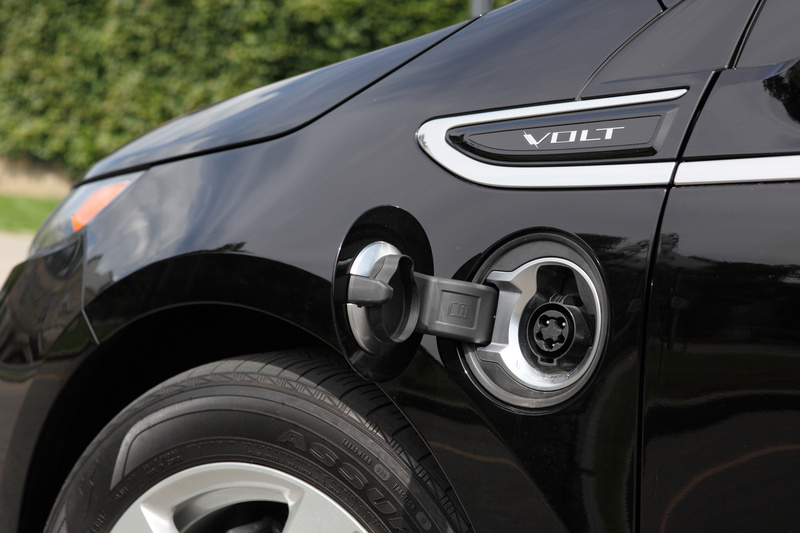 The Volt comes with a Level 1 (120 V) charger standard with the vehicle. Plugging the vehicle into to a standard wall socket will charge the 16 kWh battery in approximately 10-12 hours. Volt owners also have the option of upgrading to a Level 2 (240V) charger (think the type of plug your clothes dryer uses) which drops the recharge time down to approximately 4 hours. It should be noted the times are for a completely depleted battery to 100% charge. If you are simply topping up the battery at night charge times would be less. 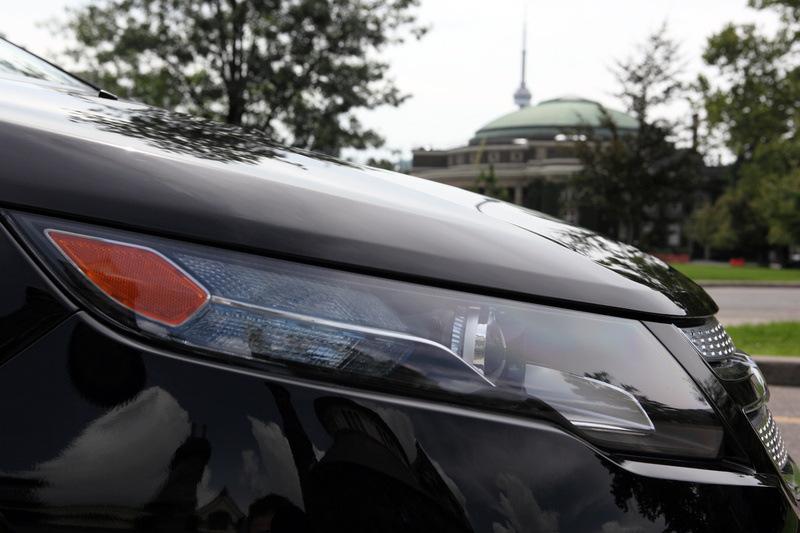 As mentioned previously a fully charged battery will allow you to drive approximately 40 to 80 kilometers. Enough for the average urban commuter to get to work and back, plus perform a few extra side trips along the way. The cost of recharging the battery will vary based on the electricity prices in the region, but in Ontario, Canada they will range from $1 to $2 depending on the time of day and state of battery charge. The vehicle allows owners to delay their charging to take advantage of time of use billing differences (in jurisdictions that have it). In other words, if an electricity provider reduces their rates starting at 8 pm Volt owners can program their vehicle to start charging after 8 pm despite plugging it in earlier. The Volt’s appearance has an understated sportiness to it and the RedlineNorth Team remains partial to the look of the Volt tester in black. 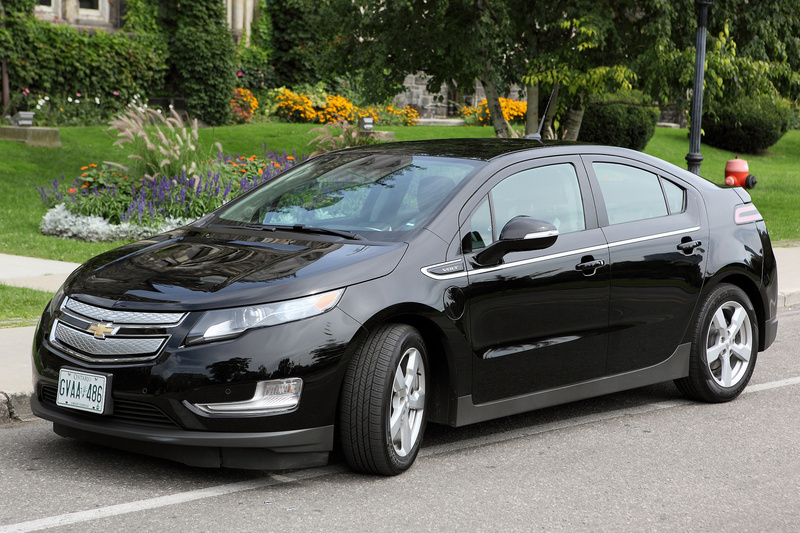 Overall, the style of the Volt has a modern look and feel with extremely clean lines and a square back end. The interior trim in the test vehicle was a glossy white plastic and initially it looked attractive, but after a while you felt like you’re riding around in a giant iPod and that look may not be for everyone. Over the course of the week the RedlineNorth Team test vehicle was recharged three times and used approximately $9 in gasoline (the Volt requires premium gasoline). Total estimated cost for the week based on $1.45/litre ($5.50/gallon) of premium gasoline and 6.5 cents per kilowatt hour of electricity was just under $13. A number of people have commented that the pay back period on gasoline savings alone on EVs is prohibitively long. Based on gasoline prices only that may be the case depending on the scenario, however, other factors such as reduced maintenance costs, along with non-monetary considerations such as the quiet ride, high low end torque, convenience of filling up at home and peace of mind around reducing your tailpipe emissions all contribute to the attractiveness of the vehicle. Focusing solely on the potential savings from fuel fill ups is a single dimensional argument that misses the point. Consumers that are buying the Volt are buying the total package and its an attractive package at that. Electric vehicles such as the Volt are remarkable in that they are unremarkable. They feel like you are driving any other similar gasoline or diesel fueled vehicle. The Volt doesn’t feel like you have sacrificed any performance or features for its class in order to be able to drive around town on electrons. Once you get over the type of ‘fuel’ that is powering the vehicle whether it’s diesel, gasoline or electricity you sit back and enjoy the ride. With GM already selling more than 22,000 Volts to date globally we look forward to seeing more of the Chevy Volts on our roads. 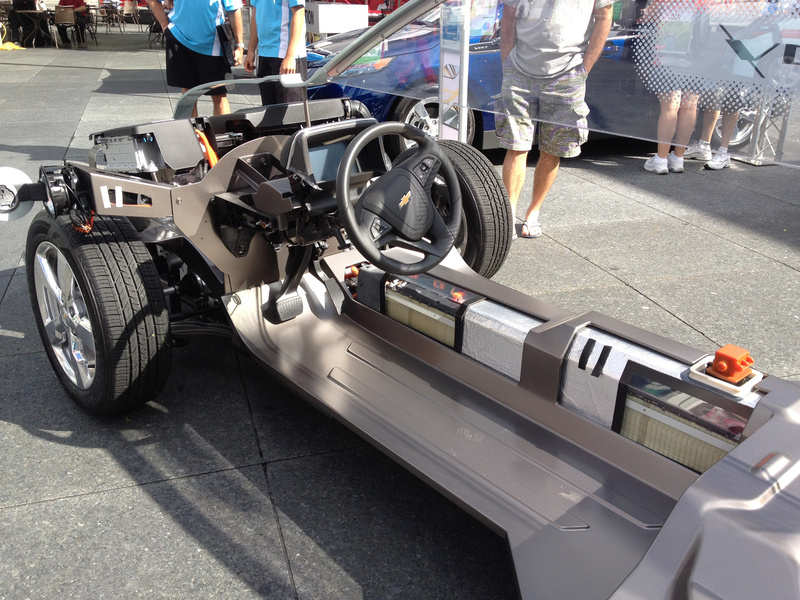 So keep your eye out for this innovative, high tech piece of auto machinery as the new 2013 Chevrolet Volt will be arriving in select GM showrooms soon. Currently in Canada, the main electric vehicle competitors to the Chevrolet Volt are the Nissan Leaf and Mitsubishi Motors’ i-MiEV which are both full battery electric vehicles. The upcoming Ford Focus EV and the plug-in version of the Toyota Prius will also provide the Volt with additional competition later on this year. This entry was posted in Electric Vehicle, Review and tagged Chevrolet, Chevy Volt, Holden Volt, Opel Ampera, Vauxhall Ampera, Volt by northredline. Bookmark the permalink.